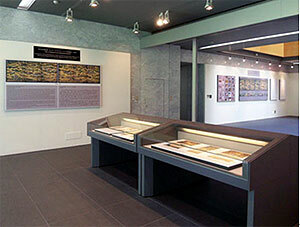 The Institute holds a panel exhibition regularly at the lobby on the first floor so that visitors to the Institute may better understand the results of our projects and research. Presently the exhibit is that related to Screens Illustrating Views of Kyoto and Its Environs (collection of the Royal Ontario Museum) that was restored under the Cooperative Program for the Conservation of Japanese Art Objects Overseas in fiscal year 2006. The various processes in its restoration and the results of art historical study on this pair of screens are introduced. Nijojo Castle and the Daibutsuden of Hokoji Temple are depicted on a grand scale on the left and right panels, respectively. 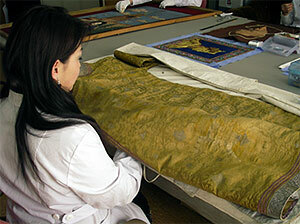 Because of this construction, this particular pair of screens is believed to have been made in the mid-17th century. It is a very valuable work of art from the point of view of art historical study because of the detailed depiction of over 1,300 figures and the existence of 77 paper tags indicating the names of temples and scenic places. It is our hope that this exhibition may enable an understanding of the role Japan plays in international contribution and cooperation. The Institute is now editing materials for the publication of the main volume in 2009 on the history of the Institute and its investigation and research, a sequel to 75 Years of the National Research Institute for Cultural Properties, Tokyo – Archives. Since a brief history of former members of the Institute will be included in this volume, we are collecting information about their personal history and other related materials. In March we visited and interviewed the family of the deceased Toyooka Masuto who was engaged in editing the Toyo Bijutsu Bunken Mokuroku, a classified bibliography of journal articles on old Asian art, from the mid-30s to 1942 as a member of The Institute of Art Research, the predecessor of the present Institute. We were able to obtain information about his personal history and achievements outside the Institute and about former members of the Institute who were his colleagues. Such information shed light on the history of this Institute before World War II. Currently not enough investigation has been made on people who were engaged in the investigation and research of cultural properties. We hope to continue our efforts so that the main volume of the publication on the 75 years of the Institute may contribute to the study of the history of research on cultural properties. Materials related to the art historian Tanaka Ichimatsu (1895-1983), who was the Director General of the Institute from 1952 to 1965, were donated by Mr. Tanaka Kazumi, the deceased’s family member, and the Idemitsu Museum of Art in March. Included among the materials are records of his research and photographs he collected. Even before World War II, Tanaka had investigated a great number of art objects and left carefully written reports with his own drawings attached. Among them are valuable reports on works of art that were lost during the War. Although these materials had been stored at the Idemitsu Museum of Art, with which Tanaka was closely related, they were donated to the Institute after his death in the hope that they may be made public and utilized more widely. We plan to make preparations for their utilization in the future. Since we have just begun to put them in order, anyone who wishes to see these materials are requested to contact the Department of Research Programming in advance. 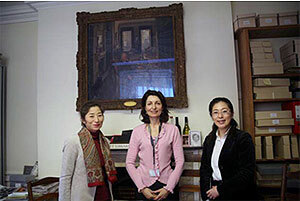 For six days from March 3, 2008 three members of the Department – Yamanashi Emiko, Emura Tomoko and Nakamura Setsukobv – visited libraries and research organizations in England to investigate the ways in which materials are collected and publicized. Visits were made, within this short period, to Sainsbury Institute for the Study of Japanese Arts and Cultures, Witt Library of the Courtauld Institute of Art at the University of London, The British Museum, British Library, National Art Library of the Victoria & Albert Museum, and School of Oriental and African Studies of the University of London. 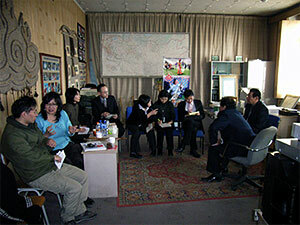 In addition to investigating their facilities, we exchanged opinions with researchers at each organization. Of these organizations, Witt Library, in particular, is one that is of special significance to the Institute since the first Director General of the Institute, Yashiro Yukio, is said to have felt the need for a library on materials related to art and obtained the idea for the founding of the Institute when he visited the Library, an extremely profitable experience in his own study of art history. 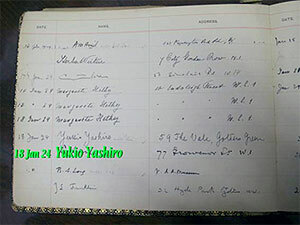 According to the guest book at the Library, it was learned that Yashiro visited the Library nine times between 1924 and 1928. Such information was meaningful in understanding the situation surrounding the founding of the Institute and the significance of collecting and publicizing information on cultural properties. We hope to continue exchange in research and to make use of such opportunities in the utilization of materials and the management of libraries. A report on the study of The Hikone Screen that was held jointly with the Hikone Castle Museum from 2006 to 2007 has been published. The work, which had been mounted as a framed work, was restored on full scale and remounted as a folding screen. Included in the report are photographs of the screen before and after restoration, and many high-resolution digital images, infrared images and luminescence images. Persons involved in the publication of this report made great efforts to provide as much information concerning this work of art as possible. For example, infrared images showing directions for the use of colors, which can be seen only underneath the paint layers, are compared with actual color images; data analyzed by X-ray fluorescence are compared with high-resolution data of corresponding points. We hope that this report may be utilized as fundamental material for the study of the screen. The report has been published from Chuo Koron Bijutsu Shuppan for the general public. Lakeside (1897), Kuroda Seiki’s oil painting of a woman wearing yukata (summer cotton kimono) by a lakeside, may be said to be one of the most popular works of Japanese art. The Department of Research Programming has published Kuroda Seiki‘s Lakeside, Artwork Archive for Art Studies, Volume 5, which studies this representative work by Kuroda from many aspects. 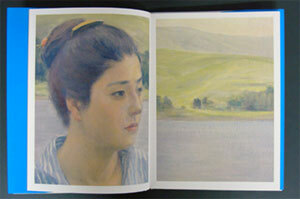 Images of Lakeside at the beginning of the book photographed by Shirono Seiji and Torimitsu Mikako (National Research Institute for Cultural Properties, Tokyo) include life-size images of the details of the painting and an image of the reverse side of the painting, which cannot be seen ordinarily, thus giving a fresh impression to a familiar work of art. Papers by Arayashiki Toru (Pola Museum of Art, Pola Art Foundation), Ueno Kenzo (Ishibashi Museum of Art, Ishibashi Art Foundation), Kaneko Kazuo (Ibaraki University), Suzuki Yasuhiro (Board of Education Secretariat, Hakone Town), Watanabe Ichiro (Art Restoration Studio 21), Tanaka Atsushi and Yamanashi Emiko (both of the National Research Institute for Cultural Properties, Tokyo) cover various topics related to the work, from the identity of the model and the place where the painting was created to the position the work occupies in the world of Japanese and Western art, the changes in its evaluation until today and the condition of the work. 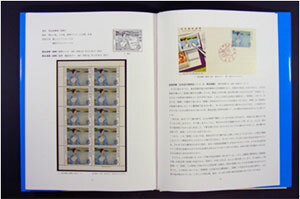 At the end of the book is a collection of texts and images associated with Lakeside, an image of a sheet of memorial stamps issued in 1967 and a poem on the painting. This is a publication that presents the “life” of Lakeside from its birth until today. 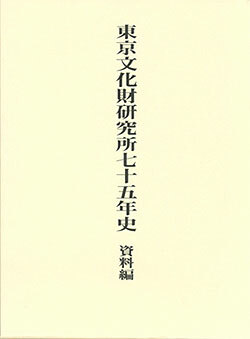 The book is published from Chuo Koron Bijutsu Shuppan and is available at bookstores. Tsuda and Sarai of the Department of Research Programming studied two Buddhist statues (Brahma and Indra), which were made in Japan during the Nara period, and collected relevant materials at The Asian Art Museum of San Francisco from March 10 to 12, 2008 as part of the Department’s project on the study of art materials and techniques. These statues had originally been at Kohfukuji in Nara, but were bought by an American collector after they passed into private hands. 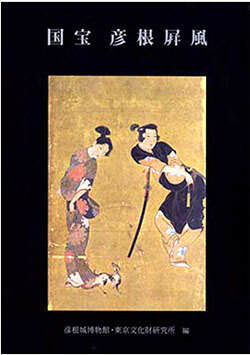 The two statues were made by a special technique that was used in the Nara period, hollow dry lacquer technique. The outer frame is composed of hemp cloth and urushi (lacquer) and the inside is left hollow except for an inserted wood that functions as support. Since a great amount of lacquer, which is very expensive, was needed and since such statues are not structurally strong, there are not many examples of hollow dry lacquer statues remaining today. In that sense, it may be said that these statues are extremely valuable. A photograph taken at Kohfukuji some time around 1905 shows, among many damaged Buddhist statues, these two statues, also greatly damaged. 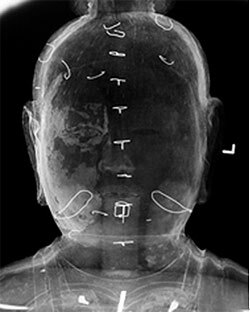 Among the documents at The Asian Art Museum related to these statues are X-ray images that provide some information concerning the restoration of the statues. For example, while the head of Indra is missing in the Kohfukuji photograph taken in the Meiji period, X-ray image of the statue unexpectedly shows the possibility that the head is that of the original. Knowledge obtained in this investigation needs to be further studied from many angles. We hope to continue the study of the technique and style of hollow dry lacquer statues with the cooperation of The Asian Art Museum. Chinghsin Wu (Taipei, PhD student at UCLA), a visiting researcher at the Department of Research Programming for a year from September 2007, presented the results of her study at the Department’s research seminar on March 26. She has been studying how the world of modern Japanese art, especially of the 1920s, accepted European art. In her presentation entitled “Classic or Avant-garde, Christianity or Buddhism – Religious Paintings of Koga Harue Dating to the 1920s,” Wu discussed how paintings by Koga with religious themes or motifs correlate with European art, from those of El Greco and other classics to the modern age, that was introduced to Japan in the 1920s. The presentation was followed by active exchange of opinion with researchers of the Department whose fields of discipline include modern art as well as Buddhist art. 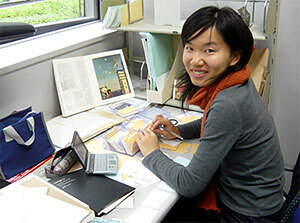 We hope that Wu will continue to pursue her research. A public record concert was held on March 28 at the Department of Intangible Cultural Heritage. The Department has been collecting sound sources related to traditional performing arts from the days when the present Department was named the Department of Performing Arts. Among these sources are a great number of valuable 78-rpm records. 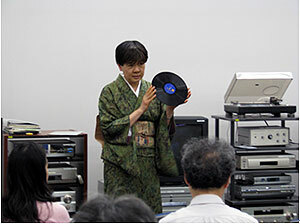 This record concert was held as an opportunity to have the public consider the issues surrounding the transmission of traditional performing arts by listening to these records, particularly of noh and kyogen, made from the Taisho to the early Showa periods. Due to the size of the room, the number of participants was limited to 21, but everyone was greatly impressed by the diversity of expression heard in these old records. The purpose of the project, “Studies on Environmental Conditions Surrounding Cultural Properties,” is to establish methods for investigating and analyzing environmental conditions surrounding cultural properties for a better understanding of the present condition and improvement of the conservation environment. 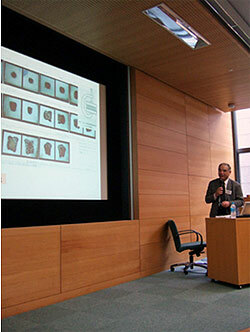 In this conference (March 3, 2008; 33 participants) presentations were made on investigation by exposure of metal samples to evaluate how atmospheric pollution and materials used for the interior of buildings affect cultural properties, with emphasis on the history and limitations of such an investigation. Mashiko Noboru (Professor Emeritus, The University of Tokyo) spoke on the influence of nitrogen oxide, sulfuric oxide, volcanic gases, sea salt and other elements on cultural properties based on studies in the field of metallurgy. Kadokura Takeo, researcher emeritus of the Institute, spoke on the history of investigation of metal exposure tests for the study of the influence of air pollution on cultural properties. Inuzuka Masahide, researcher of the Institute, reported on the development of a dosimeter that evaluates the influence of environmental conditions inside buildings on cultural properties. This conference was very beneficial from the point of view of cooperation in research and the advancement of research. From March 24 (Monday) to 26 (Wednesday), researchers of the Center for Conservation Science and Restoration Techniques conducted an on-site investigation related to the restoration of paper cultural properties scheduled to begin in fiscal 2008 at the restoration studio of Deutsches Technikmuseum Berlin as part of the Cooperative Program for the Conservation of Japanese Art Objects Overseas. 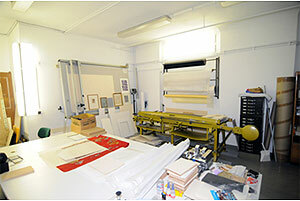 The paper restoration studio of Deutsches Technikmuseum Berlin already has necessary facilities and tools because it normally restores various paper objects. Thus, the purpose of this survey was to see if their facilities and tools are functionally satisfactory and what needs to be prepared. Based on the results of this survey, facilities will be arranged and preparations made so that the restoration of paper cultural properties in Berlin may be conducted smoothly. The Japan Center for International Cooperation in Conservation has been holding international conferences and workshops in order to promote exchange among experts engaged in the protection of cultural heritage in Asia. From the fiscal year 2007, an expert meeting will be held every year at various locations in Asia in order to construct further network among experts. 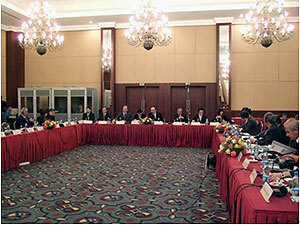 For the first year, focus was placed on Central Asia and the meeting was held in Tashkent, the capital of Uzbekistan. In addition to Uzbekistan, experts were invited from Kazakhstan, Kyrgyz, Tajikistan and Turkmenistan as well as from UNESCO to present reports on the present condition and issues related to activities for the protection of cultural heritage in their respective countries and to hold discussions. The meeting was followed by visits to archaeological sites, historic buildings, museums and an archaeological institute in Samarkand, and opinions were exchanged on methods for the conservation and exhibition of cultural heritage. The participants commented that it was very meaningful to learn about the different issues that Japan and other countries are faced with and to hear case studies of activities for the protection of cultural heritage. They also expressed their desire to continue collaboration and to exchange information. 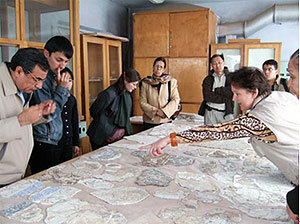 On March 20, 2008, an agreement and a memorandum for cooperation in the conservation of cultural heritage were signed between the Institute of History, Archaeology and Ethnography, Academy of Science, Tajikistan and the National Research Institute for Cultural Properties, Tokyo. According to the agreement, which is a general agreement, the Institute of History, Archaeology and Ethnography and our Institute will cooperate in conducting activities for the conservation of cultural heritage in Tajikistan, and capacity building and transfer of technology will be conducted by means of actual work of conservation and workshops. The memorandum concerns the conservation project for the mural paintings in the collection of the National Museum of Antiquities, Tajikistan affiliated to the Institute of History, Archaeology and Ethnography, and cooperation with regard to capacity building and transfer of technology related to that project. The Japan Center for International Cooperation in Conservation will begin the actual work outlined in the agreement and the memorandum from the fiscal year 2008. From February 26 to March 4, the Japan Consortium for International Cooperation in Cultural Heritage conducted investigation in Mongolia to gather information related to the protection of cultural heritage and international cooperation. Two to three hours of interviews each were held at 12 major museums and organizations engaged in the protection of cultural heritage in Mongolia. When, in 1990, Mongolia became a democratic nation, the administration of cultural properties also underwent a great change. Now laws and systems for the transmission of valuable tangible and intangible cultural heritage of Mongolia, including the culture of the nomadic people, are becoming established. Plans for capacity building and the investigation and registration of cultural properties distributed throughout the nation have also begun.